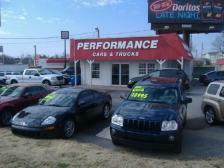 Welcome to Performance Cars and Trucks located at 3508 S Walton Blvd in Bentonville, AR. We are family owned and operated that has been in Bentonville for over 20 years. Please call us at 479-271-6779 to arrange a test drive or visit our website www.performanceofnwa.com to view our complete inventory.